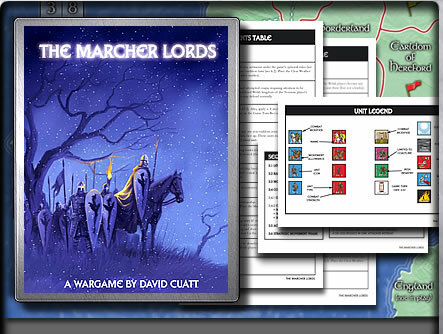 The Marcher Lords is a simulation of the Norman conquest of Wales in the 11th century. Players assume command of Norman earls or their Welsh foes, and then make the decisions that will determine the course of the war. To be successful, the Normans must fortify their conquests by building castles and then hold out against Welsh counterattacks, Viking raiders, and various other threats. The Legacy of Hastings In many ways, the famous Battle of Hastings in 1066 was just the beginning of a lengthy series of battles for the Normans, who had many challenges awaiting them in the British Isles. In order to secure the Welsh border, William the Conqueror (newly crowned King of England) established loyal Norman nobles in strongly garrisoned earldoms along the frontier. What followed were decades of warfare and diplomacy as these "Marcher Lords" sought to extend their domains by subjugating the stubbornly independent Welsh.